After my accident fifteen years ago which left me disabled, I floundered on what I should do. I made attempts to go back to work, which were disastrous, and while they weren't fatal to me, looking back now I'm wondering why they weren't? And since I've been a graphic design teacher, I turned to my computer and tried a lot of things, mostly as a way to try to keep my mind sharp while my body healed, as best it could. And that's when I discovered history adventuring, about seven years ago. If you've been reading this blog for a while, you know that there are a lot of posts, over 900 at last count. And that's because while I enjoy collecting old photos of Phoenix, I wanted to do more than just that - I wanted to step into them. 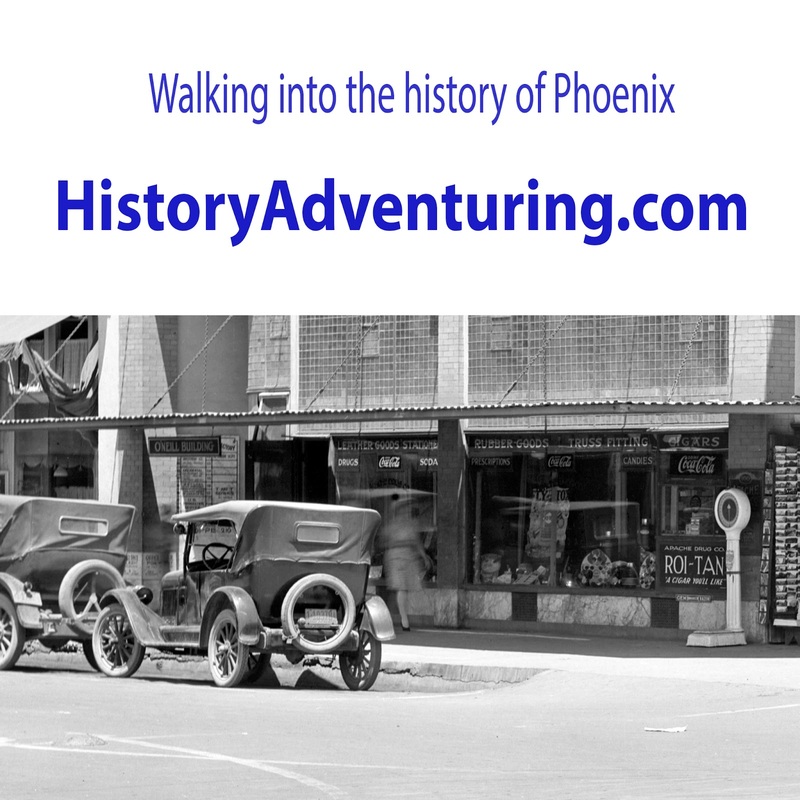 Some of my earliest posts were simply walking around old-time Phoenix, which at the time I was often unable to do physically, which was frustrating to say the least. And it was a wonderful fantasy, just walking and looking at stuff, diving into the old photos. I still enjoy it a lot, and I continue to write in the blog, and have been history adventuring IRL (In Real Life) with friends who drive, and are willing to accommodate me. I can walk, but not well enough to hike, and it's looking as if I will never be able to that again in this life. In my imagination I can, and I can do it anywhere, and everywhere, I like. And to my delight I found that there were people who wanted to walk along with me. Anyway, while I'm old enough now for a "senior discount", I'm not ready to sit around waiting for the end, which looks like is very far in my future. So I've decided that history adventuring will be my life's work. 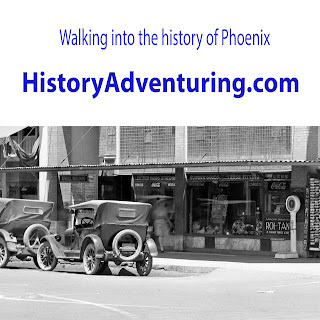 I set up a Patreon account, which allows people to subscribe, at a basic level for a dollar a month, and at what I call the PhD (Phoenix History Detective) level for five dollars a month, with a discount for seniors, veterans, and students. And my goal is to just keep doing what I'm doing. I have no interest in becoming rich and famous, but I do want to continue history adventuring. I really like the idea of Patreon, which I began thinking of as a donation site, but I'm now thinking of as a subscription - a really inexpensive subscription! And since it's my life's work now, I'm working hard on it, making sure that there's something every day, either a history adventuring blog post, or a cool photo, some of which I call "super high definition", which I create a link to, and are so huge that you really do feel as if you were walking down the street in old Phoenix. So I will make history adventuring my life's work. And with a long life, and your help, it'll be wonderful. Thank you for walking with me.